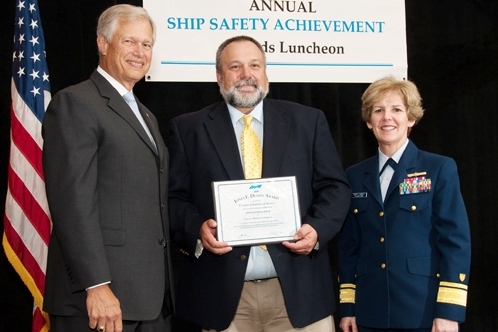 (Jacksonville, Fla.; June 17, 2010) – Twenty Crowley Maritime Corporation vessels and their crews were awarded the 2009 Jones F. Devlin Award for safety during this month’s Chamber of Shipping of America (CSA) Annual Safety Awards Luncheon. Together these vessels represent 73 total years without a Lost Time Incident (LTI), reflecting Crowley’s commitment to safety. The CSA Devlin Award is presented each year to merchant vessels that have operated for at least two years without a LTI. Crowley vessels, like the SS Blue Ridge, which has not had a LTI in five years, consistently perform above and beyond industry safety standards. More than 170 people representing over 70 companies attended this year’s luncheon in New Orleans, La. In addition to the Devlin award winners, Crowley tugs Cavalier and Sea Venture, along with their crews, were awarded CSA’s Ship Safety Achievement Letter of Commendation for their participation in emergency response efforts following the 7.0 earthquake that hit Haiti earlier this year. In February, Cavalier and Sea Venture each brought one 400-foot by 100-foot flat-deck barge to Haiti for installation and continued use as makeshift dock while Haiti rebuilds its port infrastructure. The following vessels and their respective crews received the 2009 Jones F. Devlin Award for dedication to safety: ATB Pacific Reliance/650-1, ATB Resolve/650-3, ATB Integrity/650-4, ATB Sea Reliance/550-1, ATB Sound Reliance/550-2, ATB Ocean Reliance/550-3, SS Blue Ridge, Tug Monitor, Tug Pilot, Tug Pioneer, Cape Inscription, Cape Intrepid, Cape Isabel, Cape Trinity, Cape Wrath, SS Wright, Cape Douglas, Cape Ducato, and Cape Edmont. The Chamber of Shipping of America (CSA) represents 35 U.S. based companies that own, operate or charter oceangoing tankers, container ships, dry bulk vessels engaged in both the domestic and international trades and companies that maintain a commercial interest in the operation of such oceangoing vessels.